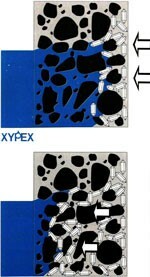 Injection waterproofing: characteristic features of the method. It is not infrequent that cracks appear in the foundation during its long service life, which makes it necessary to restore the concrete pad. Injection waterproofing is an efficient method for restoration of integrity of buildings’ foundations; the features of the method are described below. The most commonly used materials pumped into the cracks in the concrete pad are polyurethane and acrylate gels, as well as epoxy resins and cement-sand mixtures. The waterproofing materials are injected under pressure created by powerful pumps; as a result, the mixture packs the voids by gravity. The materials can be injected not only into the foundation body, but also into the space between the concrete pad and the ground. In the latter case a waterproof membrane is created above the ground, rigidity of which depends on degree of polymerization of insulation compound. Restoration procedure begins with the visual inspection of the building. During the inspection the repair workers identify the cracks to be packed. Then it will be necessary to drill through holes 2 to 2.5 cm in diameter with 0.5 m pitch. After that additional perforation is made in places where moisture affects the building. Then dead-end holes of similar diameter are drilled along the crack’s line. Metal pipes equipped with valves at the end are inserted into the produced niches. They are connected to the tank with the waterproofing material. Then the mixture is pumped under pressure into the pipes until there is a wet spot around the hole. The through holes must be equipped with protective structures to which the flow of the waterproofing material should be directed. Metal pipes with valves are to be removed only when the compound sets. 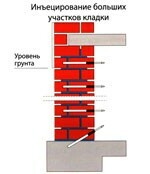 Natural restriction in regard to implementation of this procedure is air temperature below 5 degrees Centigrade, which significantly reduces efficiency of the injection waterproofing use. In the future it is possible to perform repair operations locally without investing considerable funds or effort. Materials are divided into four types: polyurethane, epoxy, acrylate gels, polymer-cement suspensions. Polyurethane materials and acrylate gels are plastic and do not disintegrate at fluctuating loads. These materials are hydro-reactive, they polymerize when exposed to water. Unlike polyurethane and acrylates, epoxy materials polymerize without water. In some cases big amount of water negatively affects operational properties of epoxy dispersions. That is why they are used less frequently. Microcements penetrate any voids or cracks; upon crystallization, they form a waterproof barrier. Structures which underwent treatment with epoxy compounds become more robust. Injection waterproofing is very efficient when it is used for waterproofing of cracks and additional reinforcement of foundations. When exposed to water, polyurethane polymers expand 20-fold. The process is rather labor intensive, that is why special equipment is used, the site is thoroughly studied, material and technologies are carefully selected. through and non-through holes – in order to create a reliable external waterproof membrane. Special equipment is used to pump the injection material into the holes to ensure protection of the building against the infiltrating moisture. If deemed necessary, a complex of measures is implemented in order to eliminate damage caused by fungus, neutralize salts, etc. Reliable waterproofness of concrete structures. The materials are applied at the early stage of construction (waterproofing of foundations) and further on during repairs and restoration of waterproofness of buildings and structures. 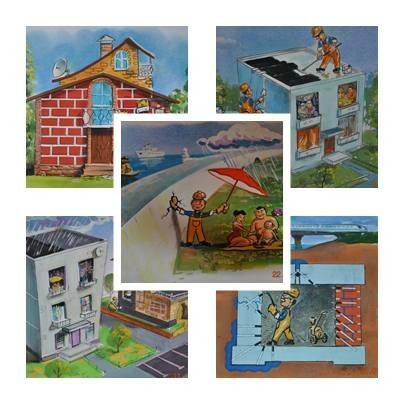 Penetrative waterproofing materials are compounds designed for spatial waterproofing of water-resistant porous material. The operating principle of the compounds is based upon penetration of solutions of active substances into the porous structure of subsurface zone of the material being waterproofed and their fixation inside in the form of insoluble chemical compounds which fill the pores and drive away liquids from them. Introduction of special substances into penetrative waterproofing materials makes it possible to additionally modify properties of the material undergoing treatment. -Prevention of corrosion processes in the reinforcing elements of reinforced concrete foundation, – restoration of technical properties of the “old” concrete stone, – elimination of moulds and fungi, – enhancement of chemical resistance of the material. The main application field: – swimming pools; – reservoirs; – tunnels and mines; – pumping stations; – foundations and dams; – treatment facilities; – water-development projects; – production premises; – buried and semi-buried structures, etc. This method implies formation of thin (up to 2.5 mm) multilayer coating, usually consisting of concrete, rubber and polymer-cement compounds, which is designed to ensure anti-capillary and anti-corrosion protection of reinforced concrete and metal structures. Pargework can be the main or axillary type of waterproofing (for example, when erecting a watertight screen). 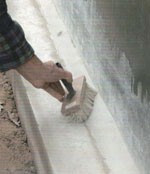 Internal surfaces of a building undergo treatment with waterproofing materials based on cement. 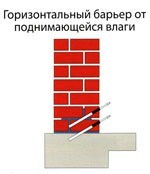 This method can be applied to waterproof tunnels, swimming pools, basements, foundations of buildings.